Guest Post by Jackie Kabler: Writing What You Know…Or Not? WRITING WHAT YOU KNOW…OR NOT? 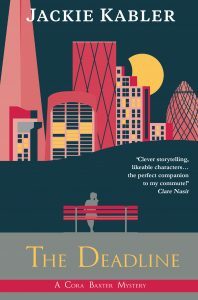 As a relatively new author – my first novel, The Dead Dog Day, was published by Accent Press last year – I had the thrill recently of appearing for the first time at a literary festival, where I was delighted to be asked to chair a panel discussion. The topic was ‘Writing what you know…or not?’, and the panel was made up of a great mix of authors with widely differing views, which made for a lively hour! I thought it was a really interesting topic. Some of the writers there considered writing about what you already know to be the ultimate in laziness, arguing that being a fiction writer is about being creative, not just about regurgitating facts and experiences from your own life. Others, including a former social worker who now writes novels based around her experiences, argued that having such a wealth of knowledge about a specialist area lends realism and authenticity to our writing. I say our, because my current series of novels, the Cora Baxter Mysteries, is set in a television newsroom, a world in which I worked as a news reporter for twenty years. My decade on breakfast show GMTV provided such a wealth of material – some of it surreal, some of it shocking, much of it hilarious – that when I decided to attempt writing a novel it just made sense to me to use that material. And I’m glad I did – some of the nicest comments I’ve had from readers of my first book were about how fascinating it was to get an insider’s view of the not-as-glamourous-as-you-think world of breakfast TV. But am I just being lazy? Should I, as a creative person, be using my imagination more in my writing? It’s something I’ve been thinking about. I’m still working on the Cora Baxter series, but now I also have an idea for a psychological thriller which will definitely push me out of my comfort zone. So – should we write what we know, or not? What do you think? The Deadline, the second in the Cora Baxter Mysteries series, is now available in paperback, e-book or audiobook format. Jackie Kabler is a journalist, TV presenter and author. Currently a presenter on shopping channel QVC, she signed a three-book deal with Accent Press in 2014 for a series of murder mysteries set in a television newsroom. She spent twenty years as a news reporter, including a decade on GMTV, followed by stints with ITV news, BBC news and Setanta Sports news. She lives in Gloucestershire with her husband, who is a local GP. Wonderful. I love how all our experiences in life can lead to another career later on. Wishing you much success Jackie. I have a little experience of a similar world and yes, strange, hilarious and shocking and surreal are words I’d use to describe it. Can so relate. 🙂 Thanks Jenny.